INFINITI is known for its luxurious sedans and SUVs, and for many car enthusiasts, quality is their number one reason for purchasing an INFINITI. That said, those who travel or need their vehicles to carry luggage and other large items, cargo space can be an essential factor. INFINITI QX50 31.4 cubic feet of cargo space with Seats up. 95.1 cubic feet behind the front seats. For those looking for an INFINITI vehicle with the most cargo space, the QX80 is it. 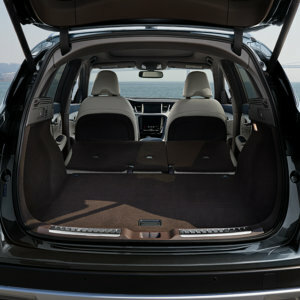 For those looking for a bit smaller vehicle, the QX50 might be a great choice with it's 65.1 cubic feet of cargo space. Please come visit INFINITI Of Beachwood for a test drive and see what vehicle option might work for you.